A world wide ransomware outbreak, like the one we witnessed last month with WannaCry, was probably just a matter of time. At least our team was not really hit by surprise: Ransomware has been on top of our Lab’s priority list for the past couple of years, but the epidemic proportions and speed of this samples’ infection have been unheard of. The entire world media reported about it across all channels: WannaCry was a major wake-up call for everyone who had previously neglected the seriousness, or worse, the existence of the ransomware threat. 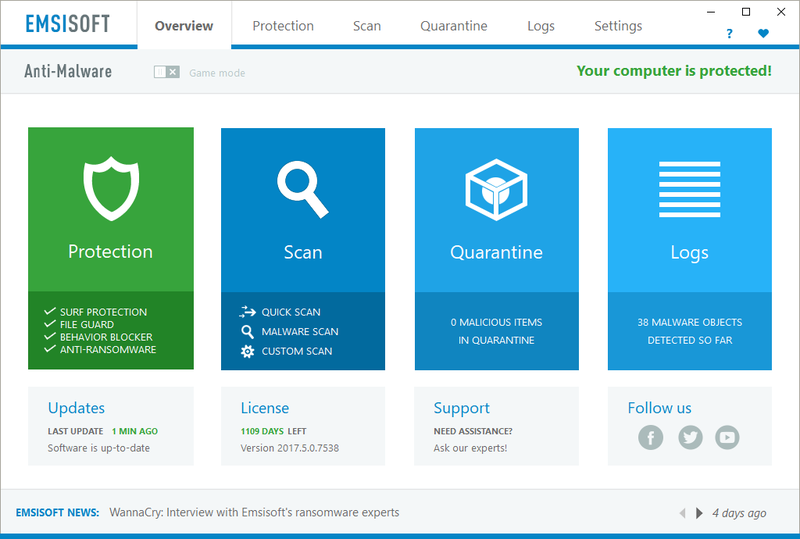 We at Emsisoft see it as our responsibility to keep you safe from all kinds of ransomware, and we are confident that we can stay technological leaders in the fight against malware that encrypts your personal files. To emphasize our products’ strength in this regard, we decided to shift our existing and proven anti-ransomware capabilities into a separate protection layer component that we are calling “Anti-Ransomware”. Contrary to most self proclaimed anti-ransomware specialist tools out there, Emsisoft Anti-Malware and Emsisoft Internet Security are able to block ransomware before it even encrypts the first data file. We consider that critically important, as recent ransomware samples have shown that criminals have become selective and are prioritizing your supposedly most important files for encryption. Our licensed security solutions don’t wait until a pattern of multiple file manipulations occurs, but intercept encrypters before they can touch anything. Prevention is key. New main guard component “Anti-Ransomware” to emphasize the trusted ransomware protection abilities that were previously part of the Behavior Blocker component. New scan setting “Scan in email data files” that allows you to include or to skip the scan of potentially large email files. User interface and user experience improvements. Several minor detection related improvements. Fixed a number of potential crash bugs. Fixed a bug that caused some clients to unexpectedly disconnect during Windows 10 Creator’s Update. 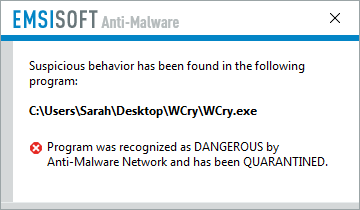 A new “Detect Potentially Unwanted Programs” option is now available for scheduled scans. Improvements in policies, reports, installation/uninstall and settings menus. Migrated the product to .NET 4.5 platform. As always, so long as you have auto-updates enabled in the software, you will receive the latest version automatically during your regularly scheduled updates, which are hourly by default. New users please download the full installer from the product pages.